The idea of seeing the place from the highest point has been always very attractive. Profitis Elias Mountain is the proper spot to do that in Santorini. Being the highest mountain of the island, it is located almost in the middle of it providing fantastic views to all the directions. 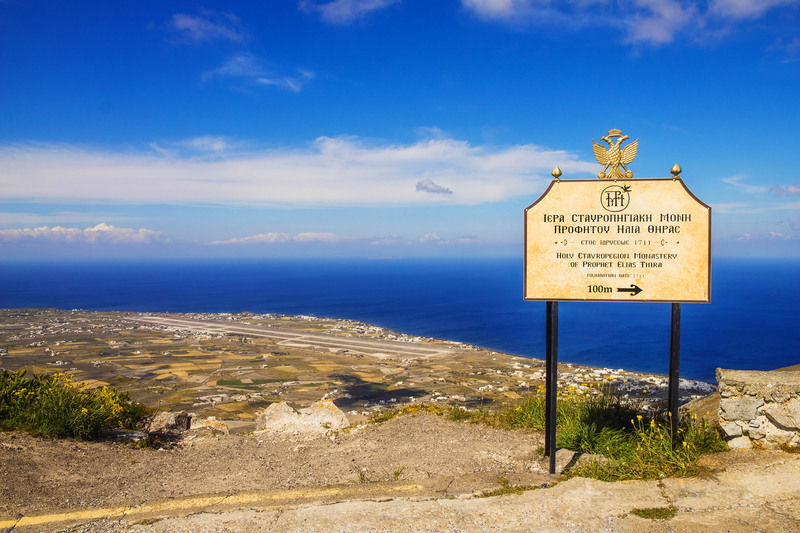 Akrotiri cape, the black beaches’ Southern shoreline, Pyrgos, Fira, Firostefani, Imerovigli and all the way up to Oia, the Volcano and nearby islands are all seen from here, while on the other side, beneath your toes a striking view of Kamari coast and the airport leaves you breathless. Profitis Elias mountain is the oldest part of Santorini. You may not expect much greenery looking at the mountain from the ground but you will be pleasantly surprised driving through the eucalyptuses’ alley and walking in the shade of pines. Same surprising is the air. This is a tranquil and quiet place where many visitors wish to stay longer just to “meditate”. All of this was one of the reasons why the spot has been chosen to establish a monastery with the same name. It was done at the very beginning of 18th century. Since then there were many changes made before the monastery started looking the way you see it now. The monks appreciate quietness, for that reason they prefer to stay away from tourists, and usually you can see the monastery from inside (a part of it) only during big religious holidays and, of course, on the name day of Elijah, 20th of July, when the monastery is celebrating. Still, almost any day of the season you can get traditional products produced by the monks from a monastery shop located on the square next to St. Nectarious church. The monastery area is closed on Sundays. On that day you can only enjoy the views from the mountain itself.